Bring all new flavors to your specialty drink menu with this Torani butter pecan flavoring syrup! This tempting flavor will complement your beverages without overpowering them or being too sweet, while the user-friendly bottle will be convenient for your busy baristas to use. Torani flavoring syrups are specially formulated to resist curdling in milk and to hold up well under heat, making them the perfect choice for espresso-based drinks, brewed coffee or tea, and more. Use this flavor for frappes, iced coffees, smoothies, and even baking! Butter pecan syrup is a great add to milkshakes or waffles. Not overpowering flavor. Customers love the sweet flavor and always want a second one. This flavor is great. The pecan is strong enough to decipher flavor and the butter portion is great for ensuring it doesn't come across bitter like some nut flavors do. Just like sipping butter pecan in a cup! We love this flavor in our lattes and our coffees. Mixes in well and gives that great flavor you are looking for. There is nothing left to say about this Butter Pecan Syrup. It is extremely masterful in its creaft and taste. It can be mixed with any flavor or be used as is. Its manufactured with the freshest ingredients and pairs well with anything you put it in. With the Holidays approaching and all of the goodies that we will be cooking this one will be high on our list to keep stocked. Get some today and you wont regret it. People have strong habits of consuming butter pecan ice cream or butter pecan pastries. So they love butter pecan flavor in their hot or iced coffee too. We use this Torani Butter Pecan Flavoring Syrup very often at my cafe and it adds the perfect touch to our coffee! I would definitely recommend this product. WebstaurantStore always has fast shipping and is consistently reliable! I love Torani! They have so many flavors to choose from. Plus, Torani IG always comment on our IG posting. The taste is so good. I love Torani syrups! They have such a huge selection of flavors and come in a great looking bottle. The butter pecan flavor is rich and buttery and delicious. I met was terrible. This definitely isn’t butter pecan, make your own if you can, this does not even compare to the original flavor at all. This goes in just about everything! I even use it to add some flavor to mashed sweet potatoes. You can make faux pralines by baking it onto pecans or flavor your bacon with it. Think outside the mug! The butter pecan flavoring syrup is rich and nutty and really tasty. A great syrup for making our butter pecan ice coffees. A great taste and quality. Great flavor with almost no color in sight! You can't tell its a syrup unless you know. This butter pecan tastes like heaven. Great and Great! I love Torani flavoring syrups. The Butter Pecan flavor is delicious and blends well into creamy thick milkshakes. It has quickly become a customer favorite! This is very mild in flavor. By itself, I wouldn't even know what it was or taste any kind of nut. I think it tastes more like maple syrup and is delicious when mixed with vanilla. The Torani Butter Pecan syrup is perfect in our german chocolate mochas! It even tastes fantastic by itself and in both hot and cold drinks! Torani syrups are always a big hit on our coffee bar. We use them for hot and iced coffees, and tea. Butter Pecan was a new flavor for us to try, and it was a huge success! We use this in our pecan pie lattes. It's a nice quality flavor that is a perfect amount of flavoring for our steamed milk in our drinks. All my customers love this syrup. They say it tastes exactly like pecans. It works great for the shakes we make and the shots that we give. I use it every day. Butter Pecan is a true southern flavor that is remade into all different food and beverage choices. The butter pecan syrup does a great job recreating that great flavor. A great way to kick u a cup of coffee. We flavor ice cream with this syrup before we mix in real pecans and toffee pieces. It sets the flavor over the top and satisfies any sweet tooth. Yummy, just like Butter Pecan ice cream, Torani, despite it being the least expensive on the site has always had a place in my heart when I first encountered flavored coffees and tried their classic hazelnut, and butter pecan is no different, true to taste and not too sweet! A great tasting syrup bursting with the robust flavor of buttery pecans. My customers love our butter pecan frappe topped with caramelized pecans and whip cream. Thanks so much for such a high quality syrup. This is a very popular flavor. We really like it. All of the torani syrups are really good and the price is very good on these items. Very sweet and nutty flavor to pair with coffee. It smells and tastes great. It is very sweet so use sparingly. It is a nice addition to the pantry and unique flavor. Everyone likes my butter pecan ice cream sundaes much more now that i use this butter pecan flavoring syrup. I've used other brands and they're just not as good! This flavor is great in lattes! It is also yummy in a frappe. Torani is great for a great syrup at a great price. This is a more unique flavor that other brands do not offer. Tasty and tastes just like butter pecan. Good packaging and it was also efficient. Shipped and received in perfect condition. No cracks in bottle or box. Classic, Natural butter pecan flavoring that goes great in drinks, baked goods and any other food product. Torani offers many all-natural flavors and stands for the utmost quality. We have pork and beans with molasses, brown sugar and maple, so why not butter pecan sryup with it? It was good and different even in my tapioca pudding and my white chocolate carme capachino! We just recently opened a bookstore with a coffee shop. We love the Torani syrups with their natural flavors. We use this one in our Christopher Pralini cappuccinos. Butter Pecan and Vanilla Bean with whipped cream and a sprinkle of cinnamon. A customer fave! Great syrup for coffee products! The flavor is rich and sweetens coffee with out additional sweetener. It is a thinner than the sauces so more is needed for the right flavor. Use this for your iced coffee is soooo good. You will love it. I love this and I also use this in some desserts. So yummy! We have ordered Torani for over a year now! It is almost exclusively the only brand we trust going into our drink and food items. Holiday is approaching and Butter Pecan is a huge hit. Great flavor. Have used it for various drinks, which all have turned out delicious. Also have used it to make homemade ice cream, which was also a hit. The butter Pecan is delicious, one of the most versatile, and favorites of the customers. It can be mixed with most other flavors and sauces as well as used in baking applications. we operate a coffee/ sandwich shop...we offer a large selection of coffee flavor syrups this has bee a very good addition to our menu very nice flavor. Great for lattés and frappes. I do enjoy blending this syrup with chocolate and caramel. It makes a great turtle latte. Make sure to add whipped cream! 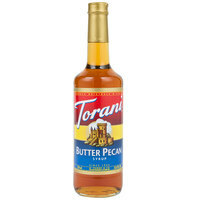 Torani Butter Pecan flavored syrup is a delicious tasting syrup. It can be used in coffee, pancake batter, cake and muffin mix, whipping cream, and even in hot chocolate and tea to make your own unique flavor.